There has been a rise of brands using controversial issues in their advertising campaigns: Nike’s Kaepernick ad campaign has obviously proven successful, and Patagonia recently positioned itself politically in support of two democratic senate candidates prior to the midterm elections. But does bold and controversial marketing work for all brands, or can only some access this strategy? We launched a survey to 1,000 respondents to find out which brands would stand to benefit from a riskier campaign and which modern movements might influence consumer behavior. Our findings show that across the board, Americans regardless of age, race, income level, and education deemed “positive” brands that supported the “troops/ military” while almost universally agreeing that brands supporting a “specific political candidate”, the “right to bear arms”, or a “specific set of religious beliefs” were negative affiliations. However, in spite of Patagonia choosing one of these unpopular associations to put its weight behind, we expect that the risk is going to be worth the reward. 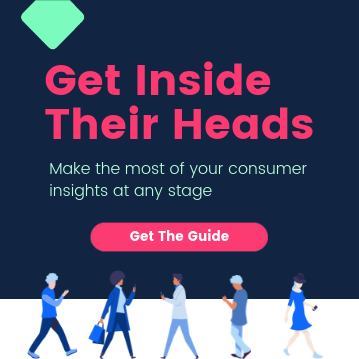 Consumer preferences show some clear trends about which causes are acceptable and which should be avoided in advertising, however, the results suggest that brands ultimately aren’t going to lose their most loyal customers. Across our survey of 1,000 respondents, nearly every group said that if a brand that they currently support were to start supporting something they disagree with, they would “most likely continue to buy” their products. Many people suggested it would depend on the cause, but that ultimately it was unlikely that it would affect their decision to buy from that brand. However, respondents said that they were “very likely” to shop with a brand that aligned themselves with a cause that they agreed with, creating an opportunity for brands to take a stand and obtain new customers with a low risk of losing the existing ones. Brands that support a “woman’s right to choose” behind closed doors but have considered it too risky to make public may want to have a second look—especially among younger cohorts. 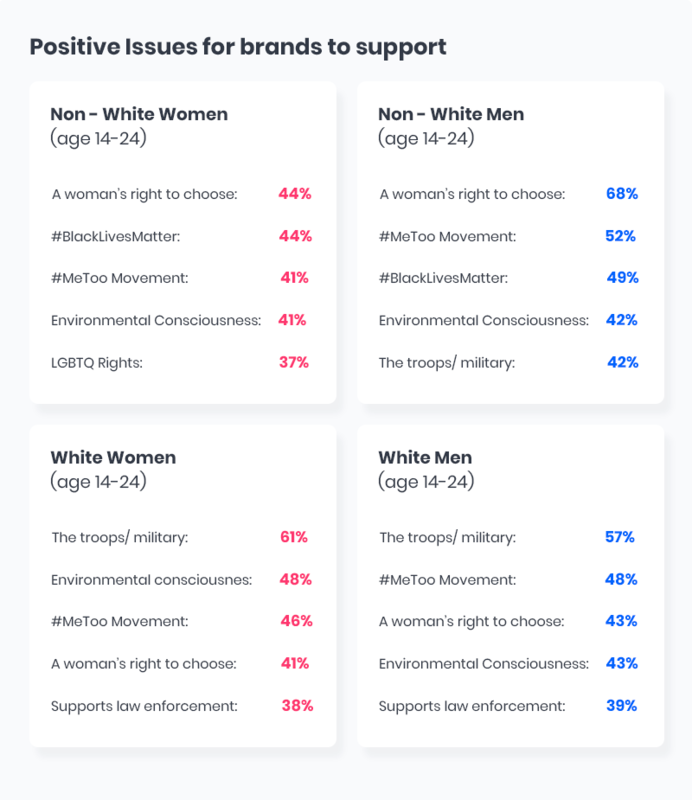 For non-white women, age 14-24, “A woman’s right to choose” along with “#Blacklivesmatter” were both tied as leading “positive” causes for a brand to support, each with 44% of the favorable responses. Perhaps more surprisingly, nearly 70% of non-white men in this age group listed a “woman’s right to choose” as a positive cause for brands to support. The second most popular among non-white men under 24? The #Metoo movement. Non-white men and women in this age group were also more likely than their white counterparts to let their wallets do the talking. 61% of respondents said that they would be “very likely” to buy from a brand that stood behind a cause that they considered positive, and 42% said they were somewhat likely to boycott one that stood for something they didn’t agree with. #MeToo also gained popular support from white men and women in the 14-24 age range, although for both groups, it came second in popularity to a brand supporting the troops/military. White respondents in this group were less likely to put capital behind their convictions—nearly 50% said their purchasing behavior would remain neutral if a brand supported a cause they disagreed with, and they were not likely to boycott a brand based on it. Only 50% said they were “very likely” to purchase from a brand that supported a cause they agreed with. Which is good news for LGBTQ rights—in spite of 43% of white men between 14-24 claiming that this would be a negative cause for brands to support, they also would be unlikely to change their purchasing behavior based on it. Men were slightly less likely to be influenced by brand alignment than women, with 22% saying it made no difference in their purchase intent and about 35% suggesting that they would likely continue to buy from a brand that began to openly support a cause they disagreed with. Women had a more centrist response, with 70% suggesting that their continued purchasing behavior was dependent on the cause and only 15% responding with either extreme of “no difference” or “boycotting”. 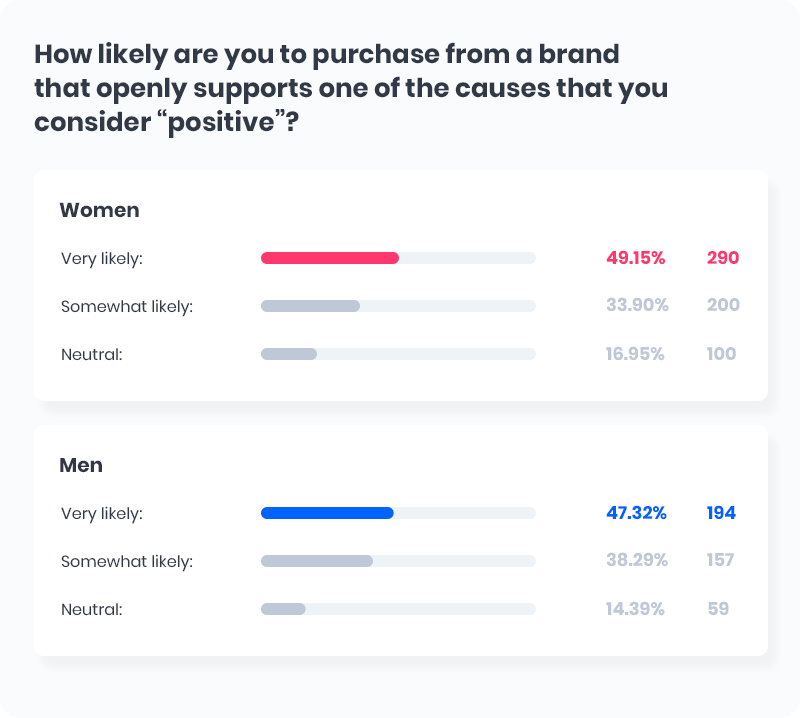 Nearly half of respondents from both sexes said they would be “very likely” to purchase from a brand that openly supported a cause they agreed with. REI, who already focuses on environmental consciousness as a part of its core values, may consider targeting women more with their advertising. In spite of “environmental consciousness” being the second most popular positive cause among women who took the survey, only 35 of the 590 female respondents reported being REI shoppers themselves. Mid-range earning men rated themselves both highly likely to buy from a brand that supported causes they believed in and were one of the least likely groups to continue to support brands that didn’t. So long as Samsung stays away from a “specific set of religious beliefs” (the leading negative affiliation according to middle-class men) they should be able to maintain their position as the leading consumer electronics brand among this demographic—although there is potential for Sony, the second most popular electronics brand reported by middle-income men, to overtake the number one spot if they took an activist stance in favor of a cause this group finds positive. Our findings conclude that there are opportunities for both newer and established brands to enter the world of controversial advertising in an effort to gain more market share among unexpected audiences. However, brands that have failed to understand their target audience and released ads that have come across as disrespectful should serve as a cautionary tale to those weighing the risk. Brands should consider which causes they genuinely support and ensure that they execute their strategy with care by surveying the target audience thoroughly prior to launching their campaign.